On January 20-21, 2019, the last total lunar eclipse occured until 2021. And it was truly beautiful one. The Moon was not only orange-red this time, but also showed clearly visible bluish tint of turquoise effect caused by Earth’s ozone layer. I witnessed the whole sky show from Boa Vista island (Cape Verde), luckily with clear skies for the total phase (which was not sure even few minutes before it). Even if the totality took about 62 minutes, I tried to enjoy every second. Maybe even because this time it was last total lunar eclipse during perigee full Moon until 2033. It allowed me to capture a bit more details with my typical equipment (Canon 6D, MTO 1100/f10.5) than usually. For all three phases of the sequence was set the same settings: ISO 500 and 15s exposure (on Vixen GP-2 mount). Closer look on the image above reveals, actually, even more. There is a small white dot on the lunar surface, which doesn’t look like as any hotpixel, dust particle or reflection, but real phenomenon. 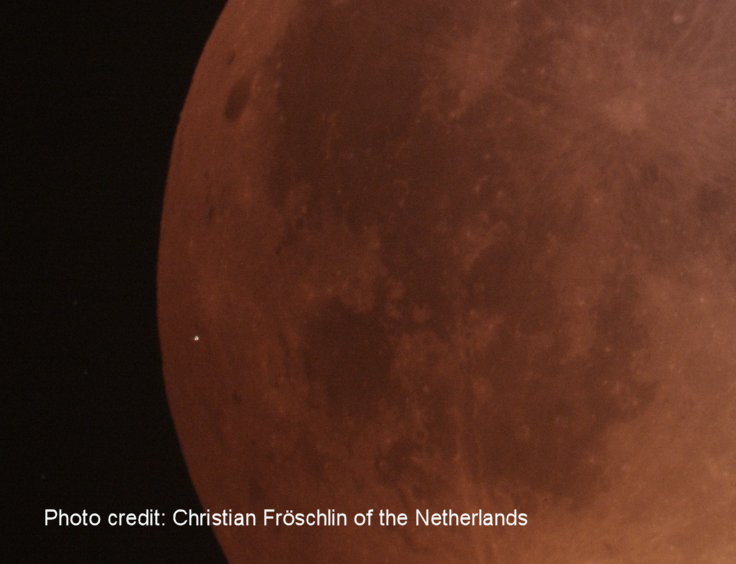 And it seems to be truly lucky shot of meteoroid hits on the Moon. According to several records around the world, the impact occured at 4:41:43 UTC. Take this closer look below. As written on Spaceweather.com, analyzing one sharp image taken by Christian Fröschlin of the Netherlands, geologist Justin Cowart has estimated the selenographic coordinates of the impact site: 29.47S, 67.77W +/- 4km. This puts it just to the west of the lunar crater Lagrange H. NASA’s Lunar Reconnaissance Orbiter may be able to use such coordinates to target its cameras and photograph the crater.